If you garden in hot, dry conditions, it’s worth seeking out plants which will thrive in this situation. With climate change giving us unpredictable weather patterns, it’s helpful to know that a prolonged period of drought is not going to kill off all your plants. Then when drought conditions are declared, accompanied by hosepipe bans, you can relax, knowing that your plants will be none the worse for being left to their own devices. There are many shrubs, perennials and annuals, from around the world, which are accustomed to dry conditions. Here are my 5 choices for plants with good drought tolerance. 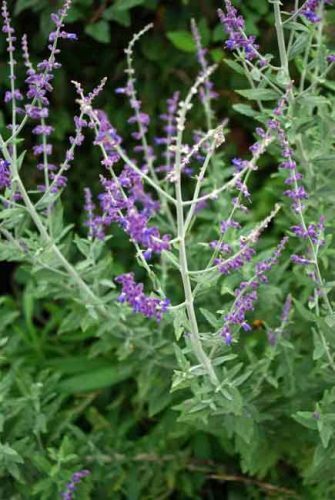 Russian sage is a bushy, deciduous shrub, grown for its upright spikes of lavender-blue flowers and deeply-cut, aromatic foliage. Perovskia is a tough plant and, once established, does not need regular feeding and watering. Perovskia atriplicifolia ‘Blue Spire’ grows to 1.2m. Perovskia longin is a little shorter but more upright in form. For a smaller plant, try ‘Little Spire’, which reaches only 60cm. Click here for the Weatherstaff Fact file on Perovskia. 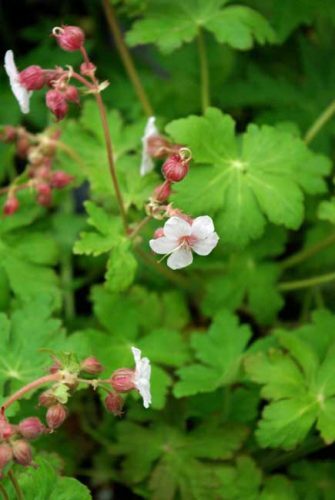 Geranium macrorrhizum is mat-forming, with aromatic, light green foliage and early summer flowers. The leaves take on autumn tints, which, unless the weather is particularly severe, are usually retained over winter. It is a particularly useful drought-tolerant perennial, spreading by means of rhizomes to form effective groundcover, even in dry shade. The plant’s shallow rhizomes make it easy to pull up any excess growth. 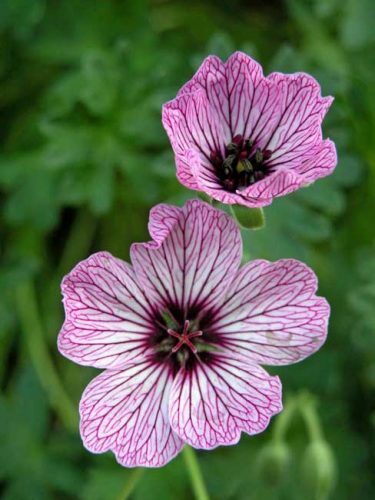 Geranium macrorrhizum ‘Spessart’ has dense clusters of white flowers, with pink centres and red-brown calyces. ‘Bevan’s Variety’ has deep red-purple flowers, with red calyces. 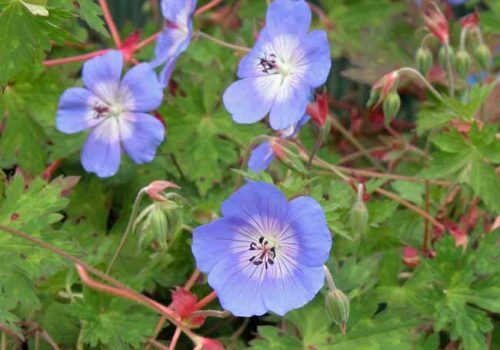 Geranium ‘Rozanne’ is a superb herbaceous perennial, forming mounds of deep green, slightly marbled foliage. The divided leaves take on red tints in autumn. Charming, violet-blue flowers, veined maroon and with white centres, are carried from early summer to mid-autumn. 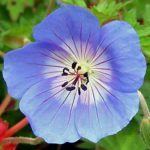 Geranium cinereum is an alpine geranium, forming a compact mound only 15cm high. ‘Ballerina’ is easy to grow, long-lived and deservedly popular. In late spring and early summer, it produces clusters of delicate, pale purple flowers, attractively veined in deep red-purple and with a dark maroon centre. A striking, clump-forming perennial, adding a touch of drama to borders. The plant forms a neat mound of spiny leaves, which are grey-green, white-veined and very deeply divided. From mid- to late summer, branching stems bear striking flowerheads, consisting of a cone of metallic blue florets, surrounded by a ruff of spiny, silvery-blue bracts. The upper stems are also suffused with metallic blue. Eryngium copes well with arid conditions, its tap root searching deep underground for water. Cut down in autumn or leave the faded seedheads to enjoy into the winter. The flowerheads make great additions to cut flower displays and, if dried first, retain their colour well. 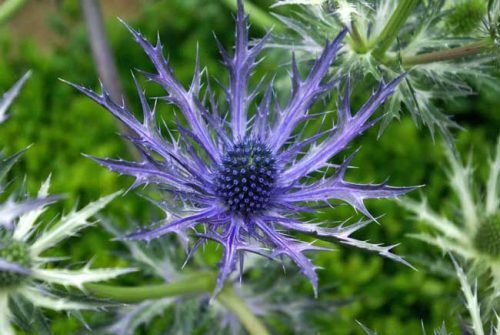 Eryngium bourgatii Graham Stuart Thomas’s selection grows to 50cm, with a spread of 30cm. Eryngium x oliverianum is taller, reaching a height of 90cm. It flowers into early autumn and has an AGM (Award of Garden Merit). 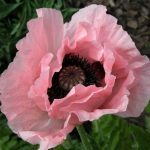 Poppies can be annuals, biennials or perennials. The herbaceous perennials are clump-forming, with attractive summer flowers. The flowers are followed by enchanting seed pods, coveted for adding to bowls of pot-pourri for winter displays. The foliage will die back after flowering and needs to be cut back almost to ground level at this stage. However, many will start to grow again by autumn, providing some winter interest. Cutting back may also induce a second flush of flowers later in the summer. 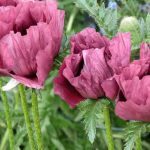 Papaver orientale ‘Patty’s Plum’ has ruffled, papery, mulberry-plum petals, with black blotches at the petal bases, surrounding a circlet of dark stamens. The coral-pink flowers of ‘Coral Reef’ have purple-black blotches at the bases. 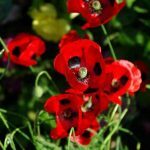 Papaver commutatum ‘Ladybird’ has large, bright red flowers, with distinctive black blotches. A bushy, evergreen shrub, grown for its aromatic foliage. Its green, felted leaves are irregularly margined yellow. Spikes of two-lipped, lilac-blue flowers, well-loved by bees and butterflies, are occasionally produced in summer. 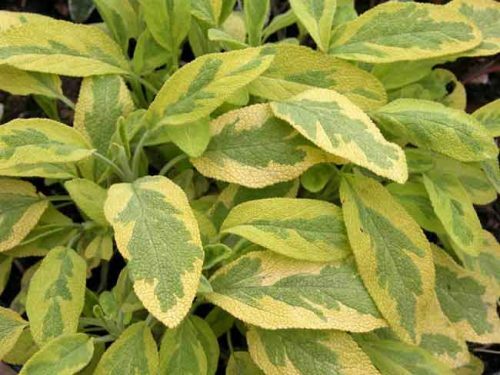 Sage likes very well-drained soil in a sheltered, sunny spot. It will appreciate extra grit dug in before planting on heavier soil. The leaves are commonly used, both fresh and dried, as a culinary herb. Since Salvia officinalis ‘Icterina’ grows fairly slowly, harvest leaves more sparingly than those from more vigorous plants. If you have a choice, buy your plants when they are small, so that they can get acclimatised gradually to the growing conditions in your garden. Improve soil structure by digging in lots of homemade compost or well-rotted manure before you begin planting. Don’t add fertiliser. This can encourage lush growth, which will require more watering. Water in well at planting time and periodically when plants are settling in. Don’t go for little and often watering – this will encourage the plant to make shallow roots, whereas you want deep roots to cope with drought conditions. Cover the bare soil around your plants with a layer of mulch to retain moisture in the soil. Gravel or small pebbles look good and add a Mediterranean flavour to the planting. It’s worth remembering that many drought tolerant plants still need a little cossetting until their root systems are established. Once settled in, they will be more tolerant of dry summers in future years. Hazy panicles of small, tubular flowers are carried on long stalks in mid- to late summer. Though it loses its silvery-grey leaves in winter, the bleached white stems continue to provide interest. Perovskia likes full sun and very well-drained soil. It will not tolerate water-logging. Dig in extra grit before planting. It will become floppy unless pruned regularly. Cut back to a woody framework a few inches above the ground, just as the leaves begin to appear in mid- or late spring. 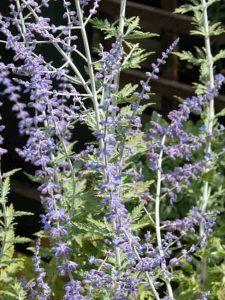 Russian sage is attractive to bees and butterflies. Rabbit- and deer-resistant. Need a Planting Plan for a hot, dry border? 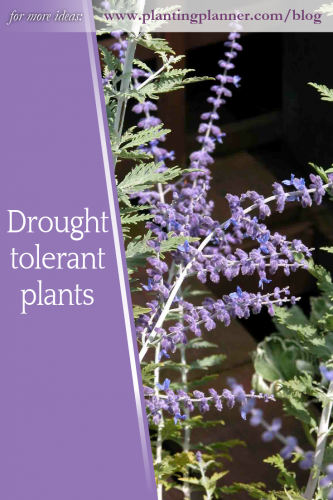 The Weatherstaff PlantingPlanner makes it easy for you to create a drought tolerant garden. The interactive gardening software designs all-season planting plans for your garden, tailored to your garden’s soil and light conditions. Choose your favourite planting style (for example: cottage, contemporary, Mediterranean) and pick your colour scheme. The PlantingPlanner will draw up an individual planting plan for you.